Ask most new hikers what their concerns are and snakes will be high on their list. While we need to be aware of snakes and show them respect, the chance of getting bitten is relatively low. The Australian Snakebite Project (June 2017) shows that on average between 2005-2015, that two people a year die from being bitten by a snake. This study also concludes that only 11% of the bites occurred in bushland however, from a hiker’s perspective that number is probably still worrying. Surprisingly 14% of envenomation occurred when people tried to catch or kill a snake, but this figure did include snake handlers. 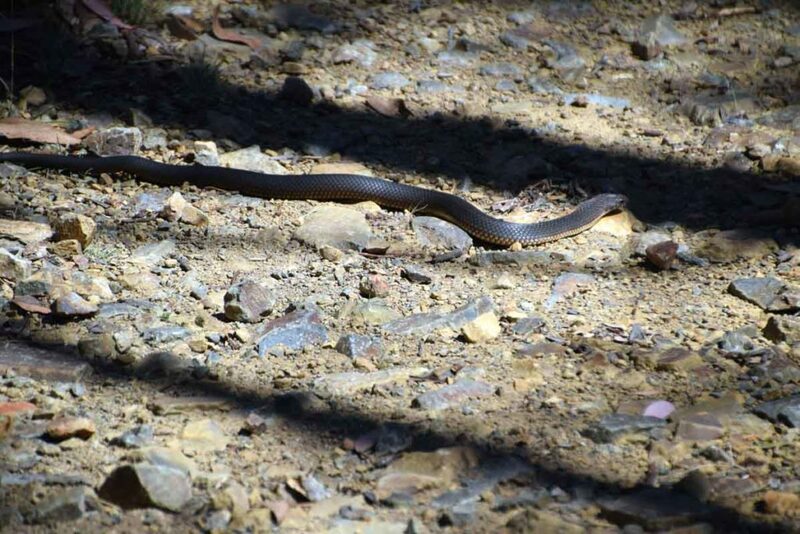 As some stage, if you are an active bushwalker, you will come across snakes on the trail. I certainly do and how we react will determine the outcome. The following information is intended as a guide to assist in getting on well with our scaly friends while out in the bush. Snakes are cold blooded and as such in the southern parts of Australia it is less likely you will come across them in the cooler months however once the days start to warm up, they are often out and about seeking somewhere warm to heat up, looking for mates or feeding. It is not uncommon to find snakes coiled up on the trail sleeping as often trails will be in open sunny areas so what you think might be a stick may not be. Remember to always look where you put your feet and don’t assume that when you step over logs that the path is clear. While each of these snakes has their own ‘personality’ and is often very distinct in appearance and behaviours, sometimes it’s hard to tell them apart unless you are an expert particularly given the brevity of the sighting and sometimes they don’t have the ‘typical colouration’ you may expect. You are better off treating any snake you see with respect and leaving it well alone. How do snakes view us? Snakes don’t view us a food but they may consider us as a threat. They will usually (but not always) only attack if cornered or in the unfortunate circumstance where you have accidently trodden on them. In most cases they well try to get out of our way. While most snakes have excellent eyesight, their main sense is that of smell (via their tongue). Snakes can also detect vibrations from when we walk but from personal experience when the ground is soft this sense doesn’t work so well and they may not know you are there. 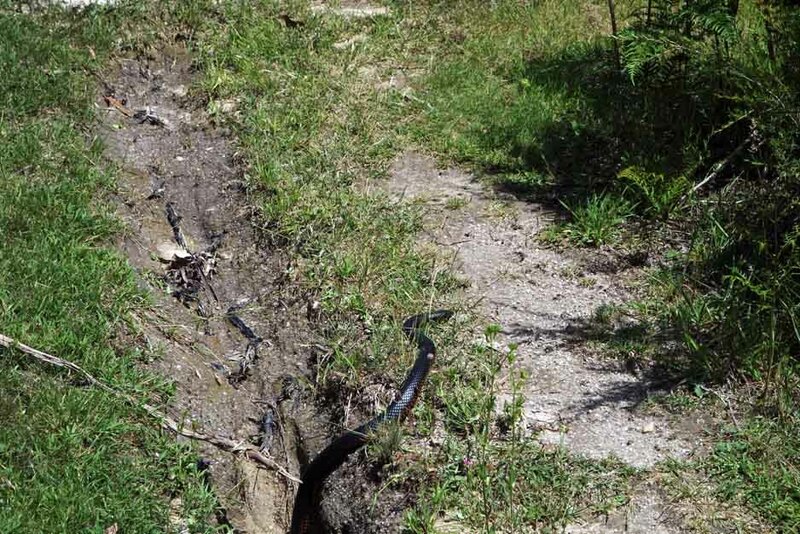 In the cover image for this article I came within about 60 cm of this Red-bellied Black snake which was looking for food. I didn’t see it till I came around a bush, and it didn’t realise I was there as the ground was so soft and spongy. I carefully backed off a few meters before taking a photo and then found another way round. What do I do if a snake bites me? So as far as snakes go, what it comes down to is plan for what happens when, and not if, you come across a snake when out hiking. In most cases just appreciate our natural fauna from a distance. In the unlikely event of a bite you should know what you need to do to help yourself or others.